I’m sure there was a question on your lips as soon as you saw that Assassin’s Creed Odyssey would feature Greek ships crossing the Mediterranean sea. I know I did. That question goes something like this: ‘Sod this Minotaur, chap, will this game have sea shanties like there were in Assassin’s Creed: Black Flag?’. Well, you can breathe a sigh of relief, as it turns out we have an answer to that question, and it’s a resounding yes. Many fans of the series have been hoping to see more naval action in an Assassin’s Creed game since Black Flag. The hope is that Ubisoft isn’t just taking all of the oceanic combat and saving it for Skull & Bones. As good as that game looks, it’s great that Assassin’s Creed will take to the seas in a big way once again. 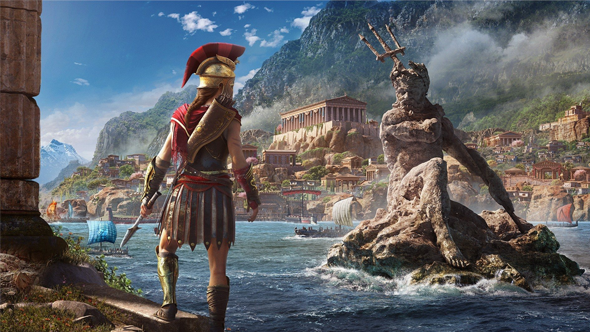 Assassin’s Creed Odyssey may make it on to our list of the best RPGs. This news comes from Dialect producer Luoise Blain who spent an hour playing Odyssey at E3. In a string of tweets, Blain details some of the highlights of Ubisoft’s new Assassin’s game, including sea shanties. I barely scratched the surface but if you have played Origins, you have the basics and can just enjoy the upgrades. Little things like being able to craft arrows. And bigger things like jumping on and off your ship like Black Flag. Ancient Greek sea shanties & leaping dolphins. Right alongside that, Blain also mentions that your sailing will be accompanied by leaping dolphins, which is win in my book.